If this dress looks oddly familiar, your mind is not playing tricks on you... I am! That's right, I bought the same dress in two prints. I couldn't decide between the bold, cheery floral and the more versatile subdued version. The plan was to return one, but you know how that goes. While packing up my bedroom, I found these old earrings tucked away in a box. They weigh nothing and are on posts, which makes them perfect for my small, wimpy ears. Rediscovering forgotten possessions is one of the few joys of moving. Love the look, especially the sunglasses. Totally agree - I love this look! The bow is just perfection with the dress! WOW this looks amazing!!! great styling. Cute! And after reviewing both outfits, I have to say that I love the floral one more. Both are nice though. I adore the big bow on the front. 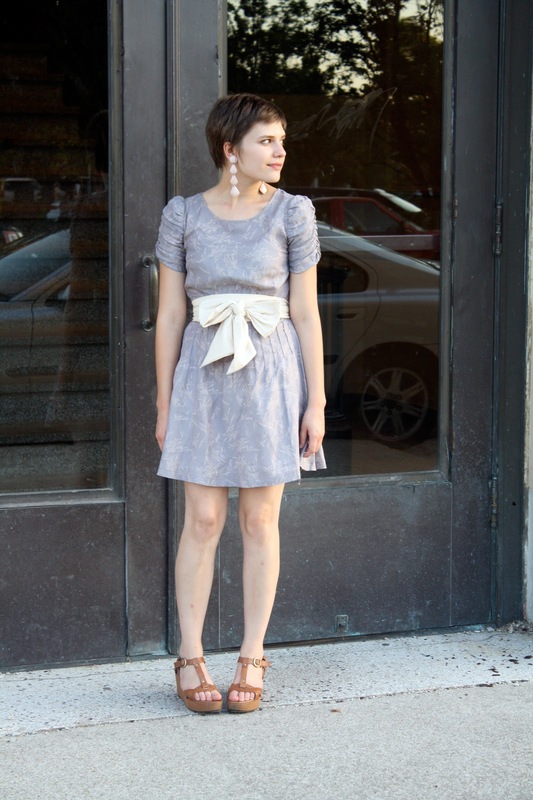 You have inspired me to go out and purchase a sash to make ordinary dresses adorable. So cute. I love those earrings with the bow and dress -- so pretty and feminine! And those shoes are great; they look super comfy too! Love this outfit and I adore those shoes! your sunglasses are so cool! wow! Wow, I LOVE this! I need to get one of these sashes. What a great alternative to a belt. I love this dress on you! Good luck on the move! Okay, seriously I bought both this dress as well as the one in the floral print from Urban. Except you got it for 15?! Mine were 30 each. I love that you bought both dresses too! :) As for the $15 price tag, all Urban Outfitters sale items were half price for one day only during my town's sidewalk sale. You're right about there being VERY few joys about moving. These earrings are definitely one of them. i feel like i remember those earrings from past posts! they're super rad with your short hair! Looove the bold white accents here. That bow is too fabulous. Love this! The dress and bow and earrings go so well together.